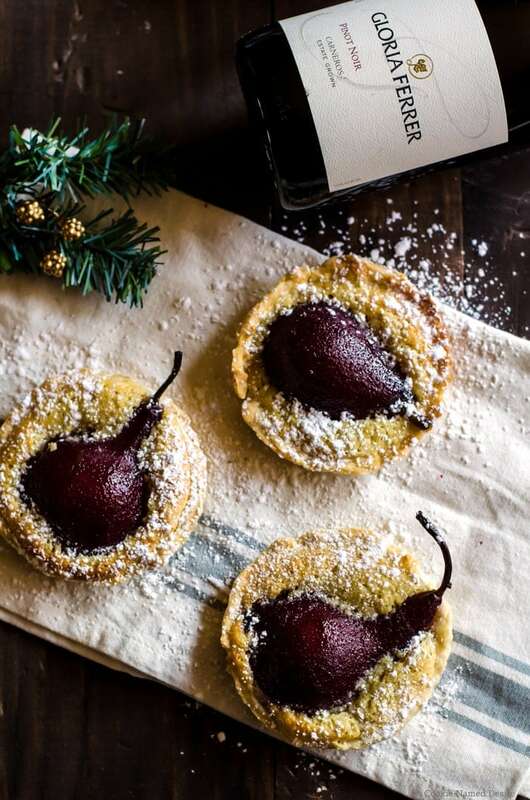 Your holiday party is not complete without wine poached pear tarts to pair with your Pinot Noir at the end of your meal. The light, flaky tart pairs well with the complex warmth of the poached pears, making it an excellent choice to impress your guests! After having the chance to try Gloria Ferrer wines a few months back, I immediately fell in love with the winery and their social, fun, and fruit-forward wines. They are such a great option for parties, and are going to be on my wine list for my own upcoming holiday party I am throwing after I visit my friend in NYC. As usual, I wanted to make sure I had a nice treat to pair with our wine. I love the earthiness of the wine that certainly reminds me of the winter months to come. The notes of black cherry, cedar, and spice inspired me to use poached pears. I wanted to have something light and less messy than simply serving poached pears in its sauce (and perhaps even eat by hand as the night went on!). 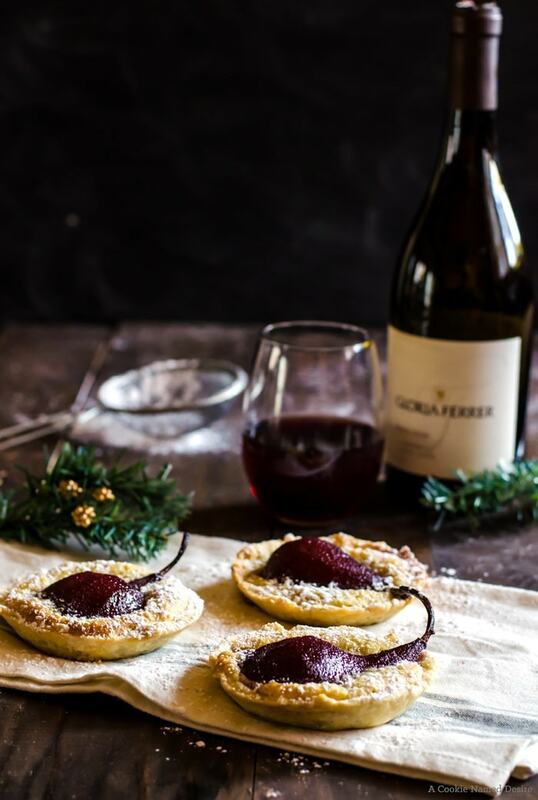 The obvious choice for me was to create small wine poached pear tarts for us to eat with the Gloria Ferrer Carneros Pinot Noir. To keep the poached pear tarts lighter, I used a quick pie pastry and a homemade almond filling. The contrast of the almond filling and the poached pears elevate the earthiness of this sweet pinot noir and also create a lovely wintery visual contrast. I actually recommend saving your Gloria Ferrer pinot noir for drinking and using any table wine you may have around for the poaching. 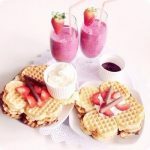 The noir is much better suited to enjoying in its natural state and not altered with the cinnamon and vanilla we add to the poaching liquid which does neutralize many of the complex flavors in the wine. 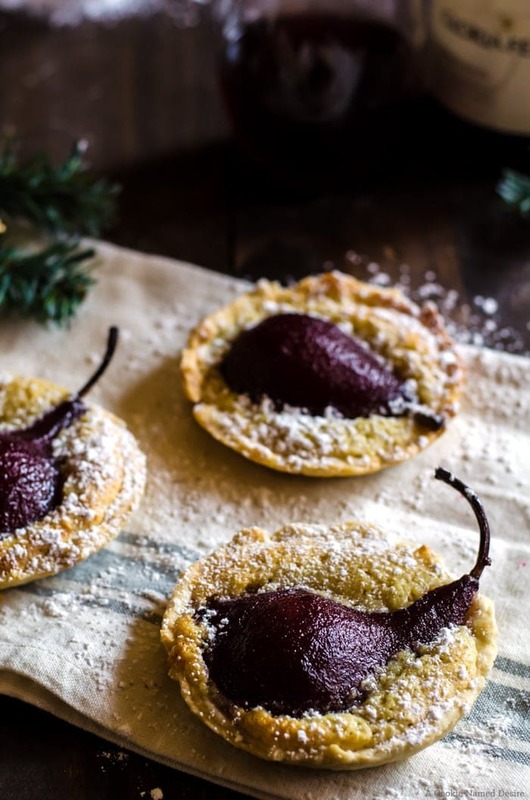 These delicious poached pear tarts make a wonderful winter holiday party dessert. 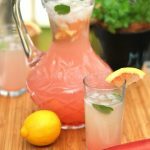 This easy to follow recipe makes the perfect pairing to your favorite wines! Peel and core the pears, leaving the stems attached if possible. Set aside. In a large pot, mix together the wine, sugar, bay leaf and cinnamon. Split open the vanilla bean and scrape the insides into the pot. Add the vanilla bean stick to the pot as well. Remove the skin from the ginger and add to the pot. Bring the pot to a boil, then down to a simmer and add your pears. Cook, covered, for about 20 minutes, or until the pears are mostly fork tender, but still a bit firm in the center. Remove from heat and leave the pears to soak in the liquid. The pears may be may a day in advance and kept in the refrigerator. Mix together the flour and salt for the tart shell together. Cut in the shortening and the butter until the mixture resembles large crumbs. Slowly begin adding the ice water a tablespoon at a time just until everything comes together to form a dough. Divide the dough in half and form into discs. Wrap each tightly in plastic wrap and chill for at least an hour. The dough may also be made a day in advance and left to chill overnight. Place one disc on a lightly floured surface and divide into 6 equal sized balls. Roll out each ball until about ¼ inch thick and place in 6 tart shells. Repeat with the remaining dough. Prick the bottoms of each shell. Freeze all the tart shells for about 20 minutes while you preheat the oven to 350 degrees F.
Beat the sugar and the butter together for the almond filling until light and creamy. Add the salt, vanilla extract, and almond extract then mix well. Slowly add in the all-purpose flour and the almond flour and beat well. Fill each tart ⅔ full with the almond filling. Half the pears and place one cut side down on the tart and gently press down. Bake the tarts for 18 - 25 minutes, or until the almond filling has puffed and is a light golden brown. As the tarts are baking, take the poaching liquid and heat on medium-high until it reduces down to a syrup. Prior to serving, lightly dust with powdered sugar and brush the pears with the syrup. Serve immediately with a glass of Gloria Ferrer pinot noir. These tarts are just so pretty! 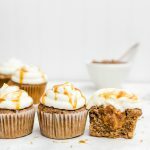 Wow, these are beautiful and sound absolutely delicious! I’ve no doubt that these are absolutely delicious but they are almost too pretty to eat!